Sep. 27, 2013 8:00 p.m.
Alfred Tauber was the Wetaskiwin Peavey Mart employee who agreed to go Pink in celebration of reaching the store's goal in selling pink ribbons for the Wild Pink Yonder fundraising ride for breast cancer research. There was a double celebration at the Wetaskiwin Peavey Mart the afternoon of Thursday, September 12th. The store had exceeded its goal in pink ribbons sold and funds raised as sponsors in support of the Wild Pink Yonder ride for breast cancer research, and it was staff member Alfred Tauber's 77th Birthday. Consequently, Alfred's hair was dyed a brilliant pink. Peavey Marts across the province began sponsoring the Wild Pink Yonder ride with the very first ride in 2009. In support of the fifth ride in 2013, the Wetaskiwin store has held a silent auction with items donated by the staff, held a couple BBQs, and sold the pink ribbons. Not only did the Wetaskiwin store exceed its goal, but it also beat the Leduc store. When the goal was set, Alfred had agreed to have his hair dyed pink if the goal was reached, so on his birthday pink it was. The Wild Pink Yonder ride is a true “made in Alberta” project. Honouring our agricultural roots and cowboy heritage, it provides an opportunity for interested individuals to ride a horse in company with many others and a horse drawn covered wagon through a major section of Alberta. Individuals may participate for whatever time they can—such as a day, a week, or the whole ride. All funds raised are designated for research into the cause and cure of breast cancer. Each year, one of the communities on the route is designated the “Pinkest Little Town in Alberta” based upon a combination of the largest per capita donations and the literal visible pinkness of the town. I understand that Fahler really put on a show this year, but the official designation of pinkest town has not yet been posted. The ride was founded by Jane Hurl who had breast cancer in 2006. The first ride was held in 2009, and each year since it has grown. Each year, the ride follows a different route through a different section of Alberta. This year they travelled through much of the Peace Country and down to Edmonton. Beginning with a Fandango in Hythe on August 9th, they travelled east to Grande Prairie, north to Peace River, then south and east to Edmonton through Slave Lake, Athabasca and the many smaller communities along the way, particularly noting 23 of them. They arrived at the Whitemud Equine Learning Centre in Edmonton on August 31st and disbanded on September 1st. Riding along would be a wonderful adventure, but the planning and organizing for the route, the nightly stops, the contacts with local communities along the way, and contacts with sponsors must involve considerable time throughout most of the year. The Hurls are to be congratulated for their dream and making it a reality, both for the pleasure it brings to participants on the ride and in communities, and for the effective research it does so much to help support.The staff of the Peavey Mart in Wetaskiwin celebrate reaching their goal and beating the Leduc Peavey Mart in sales of pink ribbons in support of the Wild Pink Yonder ride for breast cancer research. 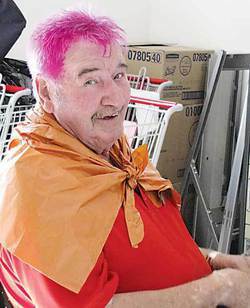 Alfred Tauber is the good sport with the pink hair.